have turned a Hans Christian Andersen story into a ballet. How did the moon landings end up in there? The two men, seated at the Groucho Club in London, are meant to be discussing their new collaboration, based on the Hans Christian Andersen story The Most Incredible Thing, about a competition to create exactly that. But the collaboration is a pretty remarkable thing in itself: the Pet Shop Boys’ first attempt at composing a ballet score, and De Frutos’s first full-length narrative dance. It’s hard to keep them on topic, though. One minute they’re expounding the ballet’s underlying theme, the life-changing power of art, the next they’re off on a tangent: everything from the fall of dictators to Noël Coward and the potency of cheap music. 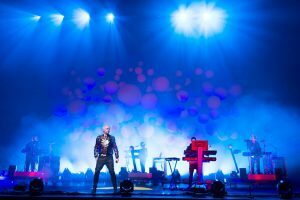 I’m privately grateful that Chris Lowe, the other Pet Shop Boy, is in bed nursing a cold. These two are handful enough. It was Lowe, however, who first saw the potential of the Andersen tale. In 2007, the Boys had been reading Andersen’s stories in a new translation. ‘Chris phoned me up to say he’d found one that would work as a ballet,’ says Tennant. Although the story was short, he adds, ‘it read like this great pitch for a ballet’. The two had been considering composing a dance score for some time. ‘When you have a long career like ours,’ says Tennant, ‘you have to keep things fresh. You have to be excited and smiling and scared shitless about something.’ Having written a West End musical (2001’s Closer to Heaven) and a film score (for Battleship Potemkin in 2005), a ballet seemed the next logical step. Sure of little beyond the fact they wanted Putrov as their leading dancer, the Boys took their idea to Sadler’s Wells, and ended up with playwright and director Matthew Dunster as dramaturge, and De Frutos as choreographer. This could have been a problem. The ballet was to be family entertainment, and that’s hardly natural territory for De Frutos, given the early solos in which he performed naked, and the glittering assault he made on the Catholic church in his 2009 work Eternal Damnation to Sancho and Sanchez. The latter earned him death threats. ‘And they were not afraid,’ butts in De Frutos. Andersen’s story hinges on a contest held by a king, who offers his daughter and half his kingdom to whoever can show him ‘the most incredible thing’. A young man builds a clock that magically contains the whole world. But before he can claim his prize, the clock is smashed by a blacksmith who argues that destroying such a wonder is an even more incredible thing than creating it. As the judges reluctantly concur, the shattered parts of the clock come back to life and take their revenge. De Frutos agrees. ‘There’s so much in there, three acts don’t feel enough,’ says the choreographer, who has revelled in exploring all its theatrical possibilities. The second act centres on the magic of the clock, the design of which was inspired by The Weather Project, Olafur Eliasson’s evanescently beautiful 2003 installation that brought a glowing sun to Tate Modern; the clock’s marvellous contents are evoked by dance and film. These include landmark moments from history, like the Apollo 11 moon landing, and great works of art, among them ballets that De Frutos references in his own choreography. The princess, a curiously deadpan character in the original, has been turned into a rebel. ‘I’ve based her on Princess Caroline of Monaco, the original bad princess,’ says De Frutos. It’s an act of homage inspired by the fact that, when Princess Caroline came to a performance of Eternal Damnation, she ‘made a bee line’ for the cast afterwards. ‘She said she’d loved the work and we all absolutely had to come to her party.’ De Frutos cast Putrov as the blacksmith: while he’s enjoyed showcasing the dancer’s burnished, classical technique, he’s also been ‘releasing Ivan’s inner bully’, hiring a fight trainer to help him through his assault on the artist/clockmaker. So galvanised are the Boys by their ballet, they’ve got a list of 10 others they want to write, starting with The Emperor’s New Clothes. ‘Javier can dance the Emperor and be naked throughout,’ grins Tennant, flirtatiously.